It's date night in Purgatory, which means dressing up, drinking, and fighting demons, as a formidable former foe stalks the gang. Den of Geek - Wynonna Earp gives us a Kate/Doc origin story, as we learn the true purpose behind the Ghost River Triangle. 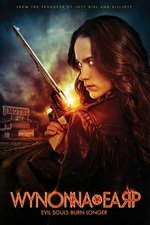 She has been doing a Keeping Up With the Earps series where she has a bio for each character and a sort of time line in each recap, and she add in bold the things we've learned new in each episode. It helps with "what the heck is Bullshart up to anyway?" type questions if you're watching the show in real time. The potato licking scene that caused so much stir from the season promo finally comes to light! Poor Robin. Peeing yourself in the barn at a cocktail party on a date is more of a college freshman look than grown-up guy with a job. I'm amused that the idea of Charlie being normal, a little sentimental, and trying to build connections with Wynonna is both deeply disturbing to both her and the audience. Poor the Stone Witch. What a terrible last chapter for her. I hope she's all dressed up and fabulous in hell, stepping on revenants with 5 inch stainless steel spike heels. I don't know if I'm going to be pleased or pissed (probably both) if it turns out this whole season was an elaborate setup for a queer woman to inhabit a new Garden of Eden so someone can make a terrible "Adam and Eve not Adam and Steve" joke.